So.. What exactly does an au pair do? Another day, another blog post from my fab life here in Spain. Today I’m going right back to the beginning of my adventure. The first two or so months of being in Spain were not a fun time for me. I’m not sure why I hadn’t thought of it before I came, maybe I sub-consciously didn’t want to, but I definitely didn’t see the tsunami wave of homesickness coming until it hit - full force. It was a lethal cocktail of being away from home for an undecided amount of time (for the first time), being in a new and foreign country, living with a new family, not speaking the language, 99% of people not speaking my language and starting a new job. Phew. As my *lovely* body often does, it decided to deal with all of this stress by giving me a full-on, three day migraine. Thanks body, like I needed pain on top of all of that! To prevent this from getting too messy (I’m really quite good a writing a whole lot of nonsense), I’ll summarise it in seven points. For me, this was a big photo wall in my bedroom. It showed me the smiling faces of all of my friends and family (and cats) whenever I needed them, even if the actual people were busy or sleeping (damn time zones!). 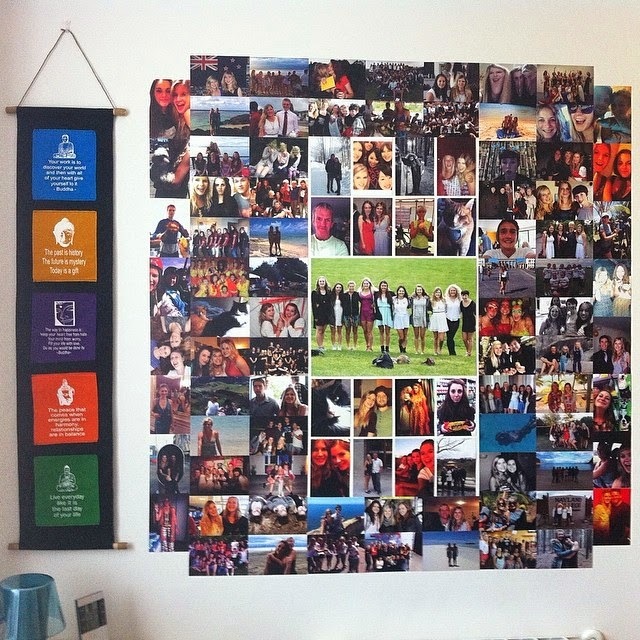 The photo wall I made for my room in Spain. The other thing this helped with was making the room feel more like my own. I always had big photo walls in my room at home in New Zealand, so this was a lovely way to make it feel familiar and like my space, rather than a sterile room I was just sort of “hovering” in. If you don’t want to put hundreds of photos up on your wall, some other options are to put a simple photo frame next to your bed or an object that reminds you of someone you miss. In a moment of desperation, I even watched a New Zealand news programme, 3 News, online – just for the familiarity of it and to listen to the accent. I think it’s really quite comedic now, but at the time it certainly helped me. 2. Keep regular contact with the people you miss – talking is good! For the first month or so, I skyped with my dad every single morning and night. I know this sounds a little over the top, but it definitely kept me sane. Even if it was just a quick “hello, how are you?” skype, it made me feel like he was much closer than an odd 20,000 kilometers away. It wasn’t so much what he said (although he did give exceptional advice), it was more just having that regularity of talking to him. Everyone is different and some people may only need this sort of contact once a week or less, but I would highly recommend this as a way of dealing with homesickness. Sometimes we wouldn’t even talk - he would just take me with him running errands, getting the mail from the mail box, putting the rubbish out, making coffee etc. Writing this now, it all sounds a bit silly, but I think you can’t really understand how that sort of thing can make a difference until you’ve been in that situation. My dad and I always play Backgammon when we’re together so we even found a website where you can play multi-player online! How cool is that. I am a little guilty of neglecting this particular point, but in hindsight I wish I had done it more. I was just so overwhelmed by everything that I didn’t exactly talk to my host parents about my homesickness in the beginning, but I think they worked out what was going on pretty quickly. Homesickness affects different people in different ways - one person may not really experience it at all, whereas another would be hit hard by it, like I was. This is really, really, really, REALLY important. If you mope around inside all of the time, you feel crap. I think even just going for a brisk 15-minute walk to get some fresh air helps clear your head and get a better perspective of things. 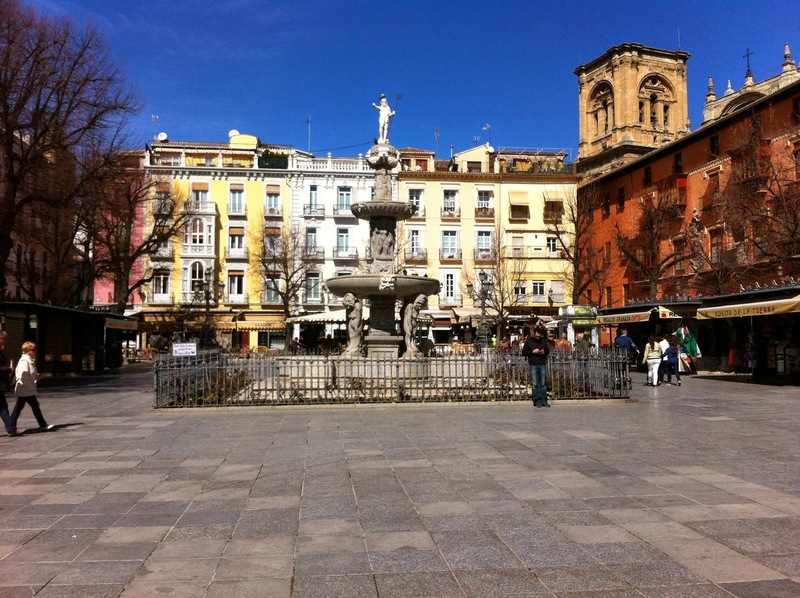 As I had the mornings free, I started to go into the center of Granada 2-3 times a week. In the beginning, I would always get a takeaway coffee and go and sit in Plaza Bibarrambla to partake in the epic sport of people watching. This later changed to going to my favourite café, La Qarmita (which I wrote about here), and reading. 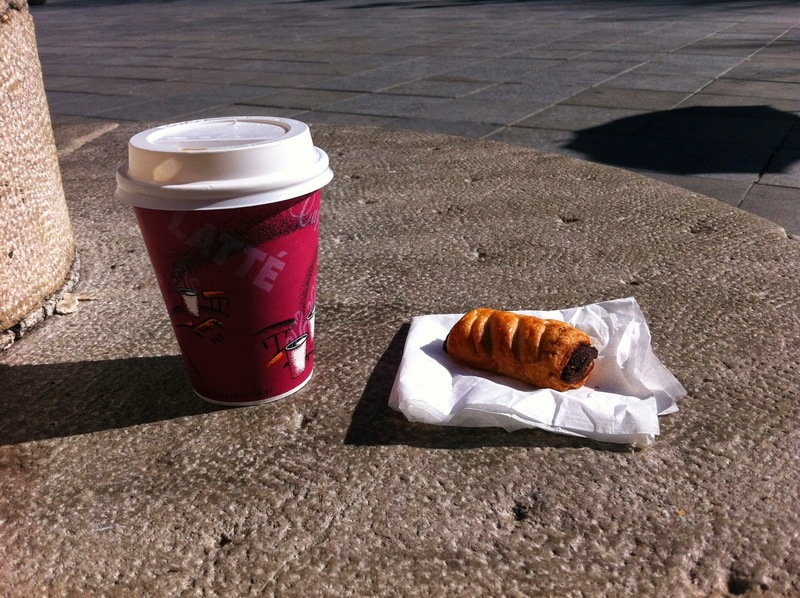 A cheeky coffee and mini pastry to start my day. Just the simple act of going and doing something made me feel like I belonged a bit more in this big, foreign city. These two places became a safe haven for me. I encourage you to find a place in your city and go there frequently - it will become a part of you and your journey. After skyping frequently, this was probably the thing that was most helpful for me to get through the homesick/settling in stage. This idea was first suggested by my dad and his partner, Sal, when I was just so ready to give up and go home (only around one or two weeks in). Sal said that I should try and stick it out for one month, and if I was still as unhappy at the end of that month, I could realistically consider going home or going somewhere else. This wasn’t to say I was going to be magically better after one month, but even a little better would be progress and would make me see that things could and would get easier. I booked myself plane tickets to go and see a friend in Germany for the weekend that marked the one-month point, as a sort of reward for myself for sticking it out. 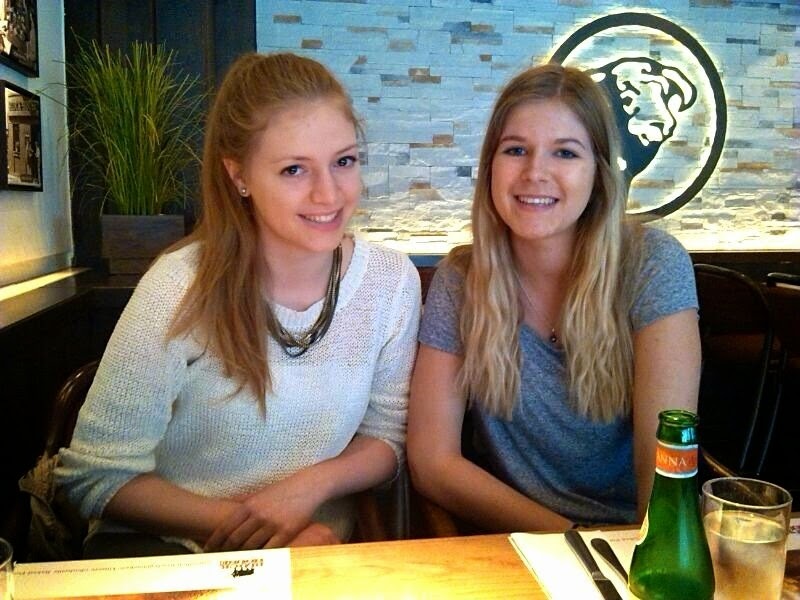 Selina and I out for lunch when I visited her in Germany. Needless to say, I made it through the first month. Although I wasn’t feeling “singing-from-the-rooftops” wonderful, I was definitely feeling more positive than three weeks beforehand. They were right! (Surprise, surprise.) From then on, I set myself little things to look forward to each month to keep myself on track and looking forwards, rather than backwards. In all honesty, after the beginning of May, I was feeling pretty happy anyway so I didn’t exactly need things to hang on to and work towards, but it was still a nice incentive. It’s okay to cry. Cry until you can’t any more. It’s super cleansing and relieves the all of the evil emotions building up inside of you. Yay! I have kind of already covered this one in my fourth point, but try your absolute hardest to stick it out and push through. 99/100 times, you won’t regret it one bit. I learnt a lot from the experience and I feel as if I grew as a person. Sounds cheesy, but it’s so true. There were times when I just wanted to curl up in a ball and get sucked into a very dark black hole of nothingness, but I made it through and now, I wouldn’t change it one bit. Because I did. And I got fat. Okay no that’s a going a little far, but in that first month, I wasn’t paying any attention to what I was eating. Turns out I was eating a lot of bad (yum, but unhealthy) foods and this inevitably lead to me gaining a fair bit of weight. And let me tell you! It’s not as easy to lose weight as it was to put on. In my opinion, it’s okay to comfort eat a little bit, as long as you are aware of it. I think that part of my brain was in hibernation, because I wasn’t thinking about it at all. There was also the fact that I was in a new country with a whooooole lot of new and exciting foods to try. Especially desserts. Mmmmmm. If I were to go back and change it (and I would if I could), I would eat these things in moderation. You have time to try everything, don’t rush it and try to eat everything in the space of a week. I hope that you enjoyed reading this post – it was a little different to normal as it’s super long, but I really enjoyed writing it and I hope it helps at least one of you. Thank you for reading; I appreciate each and every one of you! Thanks for sharing! I'm going to begin au pairing in Spain in about 1 month and love finding a blog of someone who has done it. I had trouble finding one, but this is great and you seem so sweet and relatable. I love reading about your experience and hearing your realistic advice. It's nice to hear someone say "I did this, and it wasn't always easy, but it was worth it" rather than reading a sugar-coated version that leaves out the realness and only talks about the good stuff. Thanks for helping me have an idea of what my au pair experience might hold! So.. What does an au pair do exactly?